We discuss auctions. We first distinguish two extremes: common values and private values. We hold a common value auction in class and discover the winner’s curse, the winner tends to overpay. We discuss why this occurs and how to avoid it: you should bid as if you knew that your bid would win; that is, as if you knew your initial estimate of the common value was the highest. This leads you to bid much below your initial estimate. Then we discuss four forms of auction: first-price sealed-bid, second-price sealed-bid, open ascending, and open descending auctions. We discuss bidding strategies in each auction form for the case when values are private. Finally, we start to discuss which auction forms generate higher revenues for the seller, but a proper analysis of this will have to await the next course. Professor Ben Polak: Where have my jars of coins got to? That isn’t very far. They’ve only been on one row? Well whiz them along this row as fast as you can. Just shake and pass now. Everybody who has had access to those jars, can you please write down on your notebook–just write down, but don’t show it to your neighbor–write down for each of those two jars how many coins you think are in the small jar and how many coins you think are in the large jar. How many coins you think are in the small jar and how many coins you think are in the large jar? Keep passing it along. All right, so today I want to talk about auctions. And just to put this in the context of the whole class, way back on the very first day of the class, we talked about different types of people playing games. We talked about evil gits versus indignant angels, and then for most of the course, really until this week, we’ve been assuming that you knew who it was you were playing. You knew your own payoffs but you also knew whom it was you were playing against or with. But the feature, the new feature of this week, has been that we’re looking at settings where you don’t necessarily know what are the payoffs of the other people involved in the game or strategic situation. So in the signaling model we looked at last time, the different types of worker had different types of payoffs from going to get an MBA, from going to business school, and they yielded different payoffs to you if you hired them. So we had to model the game where you didn’t quite know the payoffs of the people you were playing against. Similarly, an auction–this is what we’re going to study today–is such a setting. Typically, in an auction, you are competing or playing with or against the other bidders. But typically you don’t know something crucial about those other bidders. You don’t know how much they value the good in question. So there’s a good up for sale, and you don’t know how much they value that good. So the idea of a common value auction is that the good that is for sale ultimately has the same value for whoever buys it. Now that doesn’t mean they’re all going to be prepared to bid the same amount because they may not know what that value is. For example, imagine an oil well. So there’s an oil well out there. There’s an oil reserve out there, and different companies are trying to estimate how much they want to bid for the right to draw oil out of this oil field. Each of them is going to make a little practice well and get some estimate of how much oil there is in the well, so they’re going to bid different amounts. But at the end of the day what comes out of that well is the same for everybody. There is just one amount of oil in that well, and that oil is just worth one amount at the market price. So that’s a classic example of a common value auction. The value of the good for sale, the true value if you like, is the same for all. We’ll use the notation V to denote this common value that this object has. Now, the other extreme is private value and it’s really such an extreme it’s hard to think of good examples. But the idea is that the value of the good at hand, not only is it different for everybody, but my valuation of this good has no bearing whatsoever on your value for the good, and your value for the good has no bearing whatsoever on my value for the good. So here’s a case where the value of the good, the ultimate value of the good in question, not only is it different for all, but, moreover, it’s completely idiosyncratic and my value is irrelevant to you. So if you happen to buy this good and you learn that in fact, I valued it a lot, that makes no difference to how happy you feel at having bought the good. Now, these are extremes and most of reality lies between. I should give you the notation. Let’s use Vi to be the private values where i denotes the player in question. These are extremes and most things lie in between. So we already mentioned that on this extreme, close to this extreme, you could think about the oil wells. Oil wells are pretty much common value goods. There’s a certain amount of oil there and that’s all there is to it. However, even there you could imagine that the different firms have different costs on extracting that oil or these different firms have their machinery occupied to different extents in other wells that they’re digging. So even in that pure case, that seemingly perfect example of a common value, it probably isn’t literally a common value. Or these different firms have different distances between the wells and their refineries. So the oil well is a good example of something that’s close to common value but it isn’t really literally common value, probably, in reality. One’s tempted to say that homes are private value, after all, my valuation, my happiness from living in my house is not really affected by how happy you would feel living in my house. I don’t really care if you would like to live in my house or if you wouldn’t like to live in my house because I’m the person living in it. Is that right? But there’s a catch here. What’s the catch which makes homes not literally private value? What’s the catch? The catch is that at some point in time I may want to resell my home. The home is a durable good. It’s a consumption good, my living in it, that’s a private value. But it’s also an investment good, I’m going to want to resell that home at some point when I’m kicked out of Yale or whatever, and then at that point at which I sell it, I’m going to care a lot about how much you value it because that’s going to affect the price that I’m going to get at the end of the day. So in the case of a home, it’s somewhere between a private value and a common value. It’s true that the consumption part might be private value, but the investment component introduces common values. So really for private values, for pure private values, we need to think about pure consumption goods. Goods that I consume, they have no investment value, they have no resale value. So think about some good being sold on eBay. It’s a cake, say. So if I buy it, once I’ve eaten it, I can’t resell it. I can’t have my cake and resell it. So think about pure consumption goods over here. And even in these pure consumption goods I mustn’t get any psychological value out of thinking I managed to get that cake and you didn’t. So the private value case is really an extreme thing, but it turns out to be a useful abstraction when we come to consider things further. Now, where have my jars got to? So I’ve got certainly two rows I can play with here. Let’s talk about this auction for the jars. So what we’re going to do is we’re going to have people bid for the value in the jar. They’re going to put forward a bid. The highest bidder is going to win, and what they’re going to win is the amount of money in the jar, but what they’re going to pay is their bid. So what is that? Is that a common value or a private value? That’s a common value. There is a certain amount of money in that jar. You don’t know what it is, but there is a certain amount of money in that jar and that’s the common value. So pretty much our jars of coins lie over here. They’re probably even a purer example than the oil well. All right, now let me get the first two rows of the class, so this row here and this row here. All of you have now had a chance to have a look at the jars. Let me just get you to write down, without looking at each other, write down on your notepads–you’ve already written down how many coins you think are in the jar. For the large jar–we’ll do the large jar first–write down your bid. Just so you can’t cheat later on, write down your bid. We’re playing this for real cash, so if you win you’re going to have to pay me. So write down what you’re going to bid. Well I might not hold it to you if it’s too crazy, we’ll see, but at least in principle we’re playing for real cash. So write down your bid, without changing your bid show your neighbor your bid. Now, what I’m going to do is–if I can just borrow Ale a second–here’s some chalk. Let me go along the row and find out what those bids were. Ale you want to record the bids? So we’re going to record everybody’s bid and we’ll come back and talk about it afterwards. Where are those jars by the way? Let’s have a look at the–Where’s the jar gone? Whose got the large jar there? Yeah the woman in the corner. Hold up that large jar so that everyone can see it. That’s the bid. It’s coins in a Sainsbury’s pesto jar. Sainsbury’s pesto turns out to be quite good. All right, so I won’t bother with names today. I’m just going to get your bids. Everyone’s written down a bid. No one’s going to cheat? So what is your bid? Professor Ben Polak: Shout it out so everyone can hear. Professor Ben Polak: All right, I’m going to pass this along so? Professor Ben Polak: Shout louder than that, what was it? Professor Ben Polak: $3.80, go on. Professor Ben Polak: $4.00 again. Professor Ben Polak: Sorry, the last one was what? Professor Ben Polak: $2.01 here, that was after $1.60 though. Student: This is for the big jar? 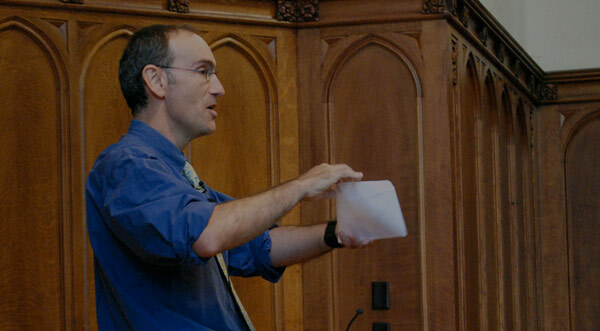 Professor Ben Polak: The big jar. Professor Ben Polak: $1.40, all right. Now we get a second row’s worth of people. Professor Ben Polak: $5.00, we’re getting some high ones now. Professor Ben Polak: $.01, okay. What’s wrong with my jar? Okay. All right, pass that along. Professor Ben Polak: That was an $.80. Professor Ben Polak: $1.20 and three more. Professor Ben Polak: All right, so we have lots of bids and the winner is? The last one was $2.00. I’ve actually forgotten how many coins were in here. Let me just remind myself. This was the large jar right? Okay now I know again. All right, so who is our winner there? We’ve got a $4.50 here, there’s a $5.00. Okay so here’s our winner, who’s our winner? Let’s have our winner stand up a second. So now a round of applause for our winner. Now, let’s talk about how people bid, and why they bid that amount. Okay, so let’s start with our winner. So why did you bid $5.00? Student: It looked like there could about $5.00 in there. Professor Ben Polak: All right, so I’ve forgotten your name, your name is? Professor Ben Polak: So Ashley is saying she bid roughly $5.00 because it looked like there was about $5.00 in there. Student: Plus you get the jar. Professor Ben Polak: Plus you get the jar, I’m not sure I’m throwing in the jar. Let’s just sample a few other people and see what they say. What did you say again? Student: I said $1.60 because I didn’t want to over estimate it because then I’d have to pay you more than I’d get. Professor Ben Polak: All right, so what was your estimate? Student: My estimate was about $1.80 to $2.00 so I bid under that. Professor Ben Polak: So your estimate was $1.80 to $2.00 and you bid around $1.60. Person next to you? Student: Well I guess $3.00 and same reasoning. I thought there would probably be about $4.00 and then I valued it at like $1.00. Professor Ben Polak: All right, so you thought there was about $4.00 worth of coin and you actually bid? Professor Ben Polak: $3.00 all right, so all of you actually wrote down initially how many coins you thought were in there, right? Is that right? Let’s just get some idea of the distribution of those. So how many people thought there was less than $1.00 in there? Raise your hand: no shame here, just raise your hands. How many people thought there was between $1.00 and $1.50? How many people thought there was between $1.50 and $2.00? How many people thought there was between $2.00 and $2.50? How many people thought there was between $2.50 and $3.00? How about more than $3.50? Clearly the people who bid high did. So we have a whole range of estimates there, a wide range of estimates, a wide range of bids. And people are saying things like: well, I thought there was this many coins in there. Maybe I shaded down a little bit from the number of coins I thought was in there because I want to make some profit on this, is that right? That’s kind of the explanations I’m hearing from people. What I want to suggest is that’s not a very good way to bid in this auction. So let’s just repeat what I think people did, and people can contradict me if this is wrong. I think most people, they shook this thing. They weighed it a bit. They figured out there was, let’s say, $3.50 worth of pennies in there. And then they said, okay $3.50, so I’ll bid $3.40, $3.30 something like that. So what’s wrong with that? Well first of all, to reveal that there’s something wrong with it, let me tell you how many coins were in there. In the larger jar there was $2.07. How many of you bid more than $2.07? Just raise your hands. Quite a few of you, all right. So what we see here is a number of people, including our winner, bid a lot more than the number of coins in the jar. What we find, by a lot, is that the winning bid was much, much greater than the true value. This is a common phenomenon in common value auctions. It’s such a common phenomenon that it has a name. The name is the “winner’s curse.” It’s the winner’s curse. And the main lesson of the first half of today is going to be: let’s figure out why there exists a winner’s curse; let’s try and avoid falling into a winner’s curse; and maybe let’s even figure out how to do better. So let’s try and think through why it is we fall into a winner’s curse. So one way to think about this is to think about naïve bidding in this context. So suppose people’s strategy was actually to bid their estimate. I know that isn’t what people did. Most people shaded their estimate a little bit. But most people bid pretty close to their estimate. What’s going to happen in that instance is what? People are going to bid essentially what they think it’s worth, and we just saw that fully half of you–I should say half the people we sampled–overestimated the number of coins in there. Is that right? Let’s just have that show of hands. How many people, raise your hands again, let’s be honest, if you thought there was more than $2.07 in there. So maybe roughly a half, maybe a little less than a half of you overestimated the number of coins in there. Now, what’s that going to mean? It’s going to mean all of those people who have this overestimate are going to overbid. But we can be a little bit more general and a little bit more rigorous about this. So let’s try and be a little bit more general. So first of all, let’s just make sure we understand what the payoffs are in this auction. The payoff in this auction is what? You get the true value, you get the number of coins–the number of pennies in the jar–minus your bid, if you are the highest; and you get 0 otherwise. I think it’s straightforward, we all understand that’s what the value is. And what do people do? People tried to estimate–this is not a mistake–people tried to estimate how many coins were in the jar. Now, in fact, the true number of coins in the jar was V which turned out be $2.07. But when people estimate it, they don’t get it exactly right, neither here where you’re shaking the jar, nor in the case of these oil samples. So what they actually estimate–each person forms an estimate, which we could call Yi–and this Yi we could think of as being the truth plus noise. So let’s call it εi. Let’s even put a tilde on it to make it clearer that it’s a random term. So for some people εi is going to be a positive amount, which means they’re going to overestimate the number of coins in the jar. And for some people εi is going to be a negative amount, which means they’re going to underestimate the number of coins in the jar. Everyone agree with that? That’s not a controversial statement, everyone okay with that? So let’s think about the distribution of these Yi’s. Let’s draw a picture that has on the horizontal axis all the different estimates that people could form of the number of coins in the jar. And let’s anchor this by V, so here’s V. And here is going to be, if you like, the probability of getting that estimate: so the frequency or probability of estimating Yi given that Vi is there. So I don’t know what the shape of this distribution is but my guess is it’s kind of bell shaped. Is that right? So it probably looks something like this. That seem plausible? We could actually test this if we had time. We could actually go around all of you and get you to report what your estimates were, and we could plot that distribution and see if it is bell shaped. But my guess is, it’s reasonable to assume its bell shaped. There’s some central tendency to estimate something close to the truth. If I’d drawn this correctly I’d have its highest point at V. I haven’t quite drawn it correctly. It’s probably roughly symmetric. Okay, so now suppose that people’s bidding strategy is pretty much what they reported. People are going to bid roughly their estimate of the number of coins in the jar. So suppose people bid Bi roughly equal to Yi. So I know people are going to shade a little bit, but let’s ignore that for now. So people are bidding roughly equal to Yi. So what’s going to happen here? Who’s going to win? If this is the way in which the Yi’s emerge naturally in life–there’s a true V and then people make some estimate of it which is essentially V plus noise–who’s going to end up being the winner, the winner of the auction? It’s going to be the person who has the highest estimate. So if there’s really a lot of people the winner isn’t going to be the person who estimated it correctly at V. The winner’s going to be way out here somewhere. The winner is going to be way up in the right hand tail. Why? Because the winner will then be the i who’s Yi is the biggest, the maximum. The problem with this is the person whose Yi is the biggest has what? They have the biggest error: the person whose Yi is the max, i.e., εi is the max. And that’s exactly what happened. When we did estimates just now the person who won was the person, Ashley, who had estimated there to be roughly (maybe a little bit more than) $5.00 worth of coins in there. So I’m guessing, is this right, that no one else estimated more than $5.00 in these two rows, is that correct? No one estimated more than $5.00. So the person who had the highest estimate bid the most, which is pretty close to her estimate, and that caused her to lose money. She ends up owing me whatever it is, $1.93, which I will collect afterwards. So the winner’s curse is caused by this. It’s caused by: if people bid taking into account their own estimate and only their own estimates of the number of coins in the jar or the amount of oil in the oil well, then the winner ends up being the person with the highest estimate, which means the person with the highest error. So notice what this leads to. On average, the winning bid is going to be much, much bigger than the truth. Is that right? The biggest error is typically going to be way out in this right tail and that’s going to mean people are going to lose money. All right, so this phenomenon is very general because common value auctions are very general. I already mentioned the oil fields. In the early period after World War II when the U.S. Government started auctioning out the rights to drill oil in the gulf, in the Gulf of Mexico, early on, it was observed that these companies, the winning companies, the companies who won the bid each time was losing money. It was great for the government, but these companies were consistently losing money, they were consistently overbidding. Be careful, it wasn’t that the companies as a whole were overbidding. It was that the winning bid was over bidding: it was the winner’s curse. Over time, companies figured this out and they’ve figured out that they shouldn’t bid as much, and this in fact went away. But you also see this effect in other places where naïve bidders are involved. So for example, those people who have been following the baseball free agent market, I think you could argue that–someone can do an empirical test of this–you could argue that the winning bids on free agents in the baseball free agent market end up being horrible overbids for the same reason. The team who has the highest idiosyncratic estimate of the person’s value ends up hiring that player, but the highest idiosyncratic value tends to be too high. Similarly, perhaps more importantly, if you look at IPO’s, initial public offerings of companies, they tend to sell too high. The baseball one I haven’t got the data, but the IPO’s we know that there’s a tendency for IPO’s, initial public offerings of companies, to have too high a share price and for those shares to fall back after awhile. There may be a little bit of initial enthusiasm, but then they fall back. Why? Again, the people with the highest estimates of the value of the company end up winning the company, and if they’re not sophisticated about the way they bid then they overbid. So this is a serious problem out there and it raises the issue: well, how should I correct this? I might, in life, be involved in an auction as a bidder for something that has a common value element. How should I think about how I should bid? We’ve learned how we shouldn’t bid. We shouldn’t just bid my estimate minus a little. So how should we think about it? Now, to walk us towards that let me try and think about a little bit more about the information that’s out there. Let’s go back to our oil well example. Each of these oil companies drills a test well in the oil field, and from this test well each of them gets an estimate of Yi. So you can imagine someone doing a test drill into my jar of coins, and when they do this test drill into this jar of coins they form an estimate Yi. And suppose that your estimate of the number of coins in the jar or the amount of oil in the oil well, suppose that your particular one is equal to 150. Then, if I then asked you the question–not to bid–but I asked you the question how many coins do you think are in the jar. Your answer would be 150. That would be your best estimate. But suppose I then told you that your neighbor, let’s go back to Ashley again. So Ashley’s estimate was, let’s say, it was 150–it wasn’t, but let’s say it was 150. And suppose I went to her neighbor and asked her neighbor. And her neighbor said: actually, I think there’s only 130 in there. So suppose Ashley now knows that she did a little test, she thinks there’s 150. But she now knows that her neighbor has done a similar test and he thinks there’s only 130. Now what should be Ashley’s estimate of the number of coins in the jar? Somewhere in between; so probably somewhere between 150 and 130, maybe about 140, but certainly lower than 150. Is that right? So if I told you that someone else had an estimate that was 20 lower than yours that would cause you to lower your belief about how many coins was in the jar. Now let’s push this a little harder. Suppose I told you not that your neighbor had an estimate of 130, but just that your neighbor had an estimate that was lower than 150. I’m not going to tell you exactly what your neighbor estimates, I’m just going to tell you that his estimate is lower than yours. So your initial belief was there was 150 coins in this jar, but now I know that my neighbor thinks there’s fewer than 150. Do you think your belief is still 150 or is it lower? Who thinks it’s gone up? It hasn’t gone up. Who thinks it’s gone down? It’s gone down. I don’t know exactly by how much to pull it down, but the fact that I know that my neighbor has a lower estimate than me suggests that I should have a lower estimate than 150. Now I’m going to tell you something more dramatic. Suppose I go to Ashley and say your initial estimate was–actually it wasn’t 150, it was $5.00–so let’s do it. So your initial estimate was 500 pennies. And I’m not going to tell you what your neighbor’s estimate was. I’m not going to tell you what your neighbor’s, neighbors estimate was. But I’m going to tell you that every single person in the row, in the two rows other than you, had an estimate lower than $5.00. So Ashley’s estimate was $5.00, but I’m now going to tell her that every single person in the room had a lower estimate than hers. So what I’m going to tell her is that Yj < Yi for all j, for all the other people. But I claim that if you tell me that everybody else–there were probably what, 30 other people there–has an estimate lower than mine–everyone else–what should I now estimate? What should happen to my estimate? It’s going to come down a lot, is that right? If my estimate was $5.00 but I know everybody else, not just one person, but everybody else had a lower estimate, then my guess of the number of coins in the jar has come down a whole lot. But what? But that’s exactly what Ashley knows as soon as she found out that she’s won the auction. If people are bidding their values–sorry not their values–if people are bidding their estimates, then as soon as Ashley discovers she’s won, she’s going to say: oh bother, I now know that my estimate was too high. She may say something more extravagant than bother, but at the very least, she is going to say: oh bother, I now know that everyone else had a lower estimate than me, and therefore my estimate of $5.00 is too high. So what’s going to happen is if people start bidding their estimates or close to their estimates, then once they’ve won, they’re going to learn exactly this. They’re going to learn that everyone else’s estimate was lower than theirs and they’re going to regret their choices. It can’t be a good idea–it can’t be an equilibrium–for people to make choices which they’re going to regret if they win. That’s crazy. So we need to think about how to correct for that. So how do we correct for it? Now let’s talk about this a little bit harder. Each of you, in your bidding for this jar of coins, I claim you only really care about how many coins were in the jar, in one circumstance. What’s the only circumstance in which you care at all how many coins are in the jar? If you win. I claim you only care how many coins are in the jar, or how much oil is in the well, if you win, if your bid is the winning bid. If your bid is the winning bid what do you know? You know that your estimate was the highest estimate in the room (at least if this equilibrium has the property that bids are increasing in estimates per se, which is not much to expect). So you know in this case, you would have an estimate Yi that was at least as big as Yj for all the other people in the room. So where are we? You only care how many coins are in the jar if you win, and if you win you know your estimate was the highest. So what’s the relevant estimate? The relevant estimate of the number of coins in the jar for you when you’re bidding, the relevant estimate is not how many coins do I think is in this jar, that’s the naïve thing. The relevant estimate is: how many coins do I think is in this jar given my shaking of it and given the fact that I have won the auction, given the supposition that I might win the auction. So the relevant estimate when bidding is how many coins do I think are there given my initial guess, Yi, and given that Yi is bigger than Yj. Now, notice this is kind of a weird thing. It’s a counter factual thing. I don’t know at the time at which I’m bidding, I don’t know that I’m going to win. But nevertheless, I should bid as if I knew I was going to win, because I only care in the circumstance in which I win. So the way in which I should estimate the number of coins in the jar, and indeed, the way in which I should bid is, I should bid the number of coins I would think were in the jar if I won [correction: less a few]. Say that again, I should bid [correction: fewer than] the number of coins I would think were in the jar if my bid ends up being the winning bid. So the lesson here is, bid as if you know you win. Now why is that a good idea? Let’s go back to this case of now you discover you’ve won. Provided you bid as if you know you won, when you win you’re not going to be disappointed because you already took that information into account. But if you bid not as if you won, you failed to take into account the possibility of winning, then winning’s going to come as a shock to you and cause regret. So the only way to prevent this ex-post regret, the only way to bid optimally, is to bid as if you know you’re going to win. Estimate the number of coins not on your own sample but on the belief that your sample is the biggest sample. Question? Student: I don’t understand what the difference is between bidding, sorry, I don’t understand what the difference is between bidding as if you know you win and what if you won right? Because if you bid, like whenever you bid, you’re bidding the number that you think, oh well, I think there are this many coins in the jar, so if I win I don’t want to bid too many so that I don’t lose, right? Student: So how is that different from bidding as if you know you win versus if you won? Professor Ben Polak: Good question. So how is it different to say bidding as if I know I win? Let me try and say it again. So what you’re going to do is you’re going to think of the following thought experiment. Suppose you told me I won, now how many coins do I think are in the jar? Let me bid that amount. So before we even do the bid, let’s do the following thought experiment. You’re figuring out how many coins you think are there. Now I say, suppose it turns out that your estimate’s the highest estimate, now how many coins do you think are there? That’s what you should bid [correction: minus a little]. I’m arguing that being told that your estimate’s the highest is going to drag down that estimate a long way. But the key idea is if you bid as if you know you win then you won’t regret winning and that’s what you want to avoid. You want to avoid the winner’s curse. Now let’s see how that goes on, let me swap places with Ale again. And let’s see if we can actually very quickly just do one row on the second jar. So this is the yellow mic. So same group of people, let me get people to shout these out fairly quickly so that we move on. So these two rows, write down your bid on the smaller jar now. This is your bid, not your estimate. Write down your bid on the smaller jar. As fast as we can go, just shout out a number. Professor Ben Polak: $1.40, okay I’m going to pass this in, so I’ll go to the other side. Keep shouting them out. Professor Ben Polak: $1.15 and? Professor Ben Polak: $.80, did I get everybody? $.80 was the last one. So okay the bids came down partly because the jar was smaller of course, which is cheating. But let me just tell you–let’s find out who the winner was first of all. So $1.60 is the winner and it turns out that the number of coins in this jar was $1.48. So what happened here? I think people took into account–people did lower their bids below the estimates. Let’s just check actually, so who was my $1.60 person? Stand up my $1.60 person, so how many coins did you think were in there? Professor Ben Polak: $1.60, your name is? Professor Ben Polak: So Robert thought there was, hang on, you bid $1.60, how many coins did you think was in there? Professor Ben Polak: $1.60, I’m not doing well here am I? So what am I trying to convince you to do here? Let me find some other bidders, so what did you bid? Professor Ben Polak: $1.00, how many coins do you think were in there? Professor Ben Polak: $1.25, okay, so how many of you–be honest now–how many of you bid significantly below your estimate? So raise your hands, how many of you bid below your estimate? Good, so we’re learning something. I feel like this is the twenty-fourth lecture, I should be able to teach you something. Okay, so the idea here is: in a common value auction you need to shade your bid considerably. In fact, most of these bids, even though you were shading your bid considerably, most of you didn’t shade it enough. So even taking this into account, even taking into account the lesson of the day, even with that into account, a number of you are still overbidding. So what’s the take away lesson? If you’re in a common value auction, you need to bid as if you have been told that your estimate is the highest estimate. That means you need to shade your estimate a lot. If you don’t do this you’ll win a lot of auctions, and you’ll be very unhappy. All right, now we’re not done here, let me move forward by moving away now just from common value auctions. So far we’ve focused on common value auctions and we’ve focused on a particular structure of auction. But I also want to talk about different types of auctions themselves because one phenomenon you’re going to be seeing out there a lot these days is that people run different structures of auctions. And auctions are getting more and more important in the U.S. economy. It used to be that auctions were something you thought of as a pretty rare event. You’d see them when people were selling cattle, and you’d see them people were selling art but that was pretty much it. But now you see auctions everywhere. We see auctions on eBay. We see auctions for the spectrum. Pretty much everything is auctioned these days. So auctions are becoming important. In fact, at Yale this year, we had a class solely devoted to auctions. We’re having one day of this class devoted to auctions, but they had a whole 24 lectures on auctions, it’s that important. One thing we should realize is that there are lots of different types of auctions. So let’s talk about four different types of auctions. Let’s call them A, B, C, and D. So the first type of auction is a first-price, sealed-bid auction. And that’s what we just did. Everybody wrote down their bid on a piece of paper. And the winner was the person with the highest bid, and they paid their bid: Ashley in the first case, Jonathon in the second–Robert in the second one. So a first-priced sealed-bid auction is what we just did, and that’s a typical auction you might see, for example, in house sales. Here’s another type of auction though. So this sounds crazy, but let me write it up anyway. You could imagine a second-price sealed-bid auction. So what happens in a second-price, sealed-bid auction? Everybody writes down their bid, each player writes down their bid. The highest bidder gets the goods so that’s the same as before. But now instead of paying the bid that they wrote down, they pay the second highest bid. So the idea is the winner pays the second bid. The winner is the person with the highest bid, but they pay the second bid. So that seems crazy doesn’t it? It seems a bit crazy. These are sometimes called Vickrey auctions. And Vickrey won the Nobel Prize, so it can’t be that crazy. We’ll come back and talk about it. Here’s two other kinds of auctions. We can think about an ascending open auction. So this is what you all think of when we say auction. This is what happens at a cattle auction or an art auction, in which people are shouting out bids. One way to think about this is, if we were auctioning off something in the class today, is that everybody who is still in the auction would raise their hands, and, as the bid got higher and higher, some of you would start dropping out. And eventually, when there’s only one hand left, that person would win the auction. Is that right? So that’s a version of an ascending open auction. Everybody raises their hands when the price is 0 and, as the price goes up, hands go down until there’s only one hand left. But we can also imagine another crazy auction, which is a descending open auction. So how does a descending open auction–So I should just say this open ascending one is what you typically see on eBay. What’s a descending open auction? A descending open auction is the same idea, almost, except instead of starting the prices at 0 and going up, I’ll start the price at infinity and go down. So now, if I start the price at infinity, none of you have your hands up I hope. And then as the price goes down, eventually one of you is going to raise their hands, and then you get that good and pay that amount. So this auction happens in the real world. It used to happen in a place called Filene’s Basement. When I was a graduate student struggling to have enough money, there was a place in Boston called Filene’s Basement, which would sell clothing in this way. So you go and pick out the suits you needed for your horrible job interview, and the price would come down each week, and you’d hope that no one bought it before you did. Sometimes it’s called a Dutch auction. So here’s four kinds of auctions. Two of them seem pretty familiar. So A and C sound like familiar kind of auctions that you’re used to seeing, and B and D seem a little weird. So the first thing I want to convince you of is that B and D are not as weird as they seem. So let’s look at these crazy auctions. The first thing I want to claim is that auction D is really the same as auction A. So let’s just remind ourselves what those two auctions are. Auction A is–it’s exactly the auction we just did for the coins. Everybody writes down their bid. We open all the envelopes. And the winner is the person with the highest bid written down, and they pay that. The descending open auction: nobody bids, nobody bids, nobody bids, nobody bids, suddenly somebody bids, and then they pay that amount. Why are those two auctions the same? Well, think about that descending open auction. During that descending open auction, each of you may have written down in your head–it’s useful to think of it this way–you’ve written down in your head the number at which you’re going to raise your hand. Is that right? So when I was a graduate student waiting for my suit to come down in price so I can afford it, and I know what the number is, and from your point of view, that’s a sealed bid for me. At the end of the day whoever has that highest intended bid, that highest sealed bid, will end up winning the suit and they’ll pay their bid. So from a strategic point of view the descending open auction and the sealed first price auction are the same thing. The person who has the highest bid, the highest strategy, wins. And they pay their bid. You don’t get to see anyone else’s strategy until it’s too late. So D is equal to A. What about B and D? So I claim that B and D are not the same but they’re very closely related. Sorry B and C. So C is what? C is our eBay auctions, our classic auction you’re all used to playing on eBay. And B is this slightly crazy thing where we all write down bids and the winner is the person who has the highest bid but they only pay the second amount. Now why am I saying that’s the same as our eBay auction in some ways? Well let’s think about the eBay auction. Here you are playing the eBay auction, so all of you have your hands up meaning you’re still in, and the price is going up. The price is going up over time, and all of you have your hands up, you’re still in. Each of you has some strategy in mind which is what? The strategy is when am I going to lower my hand? What’s the highest price I’m going to pay for this object? So your strategy in the classic eBay auction is: the price at which I lower my hand. Who wins in that open ascending auction? The person who has the highest intended bid. The person whose hand is up at the end is the person whose intended bid is the highest. But what amount do they pay? When does the auction stop? It stops when the second to last hand goes down. So if I’m the winning bid in an open ascending auction my hand is still up. You don’t know what I was wiling to pay. What I’m actually going to pay is the price of the last person whose hand went down. I’m going to pay the bid of the person whose amount that they were going to pay is the second highest amount. Does that make sense? So in an ascending open auction the winner, the person who has the highest intended bid, actually pays the highest intended bid of the second highest player. So an ascending open auction is structurally very similar to these sealed bid auctions, which is really why the sealed bid auctions are interesting. Now, having said that, they’re not exactly the same, and the reason they’re not exactly the same is that if in fact the good for sale has common value then we might learn something by the fact that the hands are up. So the fact that people’s hands are still up in the open auction, whereas you can’t see what people are doing in the sealed auction, makes these not identical, but there’s clearly a close similarity between them. Now, let’s ask, I guess, the question you’ve been wondering about, which is how should I bid at eBay? We figured out that for the common value auction on eBay, for example, if the good you’re buying is a good you’re later on going to want to resell, in that case we already know that you should shade your estimate of the value considerably. So let’s go to the other extreme. Let’s consider a private value auction. There’s no common value here at all and let’s assume that this auction is either second-price sealed-bid or open ascending. To summarize, it’s either what we call B or what we call C. So there you are, you’re bidding on eBay, and it’s a private value good: there’s nothing interesting about how much anyone else values this thing. So what’s your value? Your value is Vi. You might bid Bi. So this is your value. Your bid is Bi. And what’s your payoff? Your payoff is Vi minus–it’s not minus Bi. What’s it minus? It’s going to be minus Bjbar, and I’ll say what it is in a minute. So your payoff is: the value of the good to you minus this thing I’m going to call Bjbar (which I’ll say what it is in a minute) if you win, so if Bi is highest. And it’s 0 otherwise. Is that right? So what’s Bjbar? Bjbar is the highest other bid. So if my bid is the highest, my final payoff is the value of the good to me minus the highest other bid, the second highest bid, in other words. So question, how should I bid either on eBay here or for that matter in a second-priced, sealed-bid auction: what’s the right way to bid in these auctions? Should I bid my value? Should I bid under my value? Let’s have a poll. Who thinks you should bid over your–you’re only going to pay the second price–so who thinks you should pay over your value? Who thinks you should bid over your value? Who thinks you should bid your value? Who thinks you should bid under your value? Everyone knows this that’s good, okay good, that’s correct. So the optimal thing to do is bid your value. Actually we can do better than that, we can show–we haven’t got time now–but we can show that bidding your value in a second price auction is a weakly dominant strategy. So setting Bi = Vi is weakly dominant. It’s a weakly dominant strategy:. so it’s really a very good idea. So there’s nothing subtle about bidding on eBay if it’s truly a private value auction. You’re going to stay in until it hits your value and then you’re going to drop out. I’ll leave proving that as an exercise. What about if we switch from the second price auction, or eBay, to a first-price auction? So now your payoff is Vi minus your own bid if you win and 0 otherwise. So the first price auction you’re going to get your value minus your own bid if you win, and 0 otherwise. Now how should you bid? Remember this is a private value auction, so you don’t have to worry anymore about the winner’s curse. But nevertheless, how should you bid? Should you bid more than your value? Should you bid the same as your value? Or should you bid less than your value? Who thinks you should bid more than your value? Let’s have a poll. Who thinks you should bid your value? Who thinks you should bid less than your value? Yeah, the answer is: here you should bid less than your value. Let’s see why. Bid less than Vi. Why? Because if you bid Vi, even if you win the auction, what’s going to be your payoff? 0. If you lose the auction you get 0, if you win the auction you get 0. If you bid less than Vi, if you shade your bid a bit, then, if you win, which will happen with some probability, you’ll make some surplus. So here it’s flipped around. Here it turns out that bidding your value in the first-price auction is weakly dominated. All right, where are we. We haven’t gotten much time. We want to get one more thing out of the class, so where are we here? What we’ve argued is: in a second-price auction you’re going to bid your value, but the winner’s only going to pay the second price. In a first price auction you’re going to shade your bid under your value. You’re going to trade off two things. The two things you’re going to trade off are: as you raise your bid, you’ll increase your chance of winning the auction, but you’ll get less surplus if you win. So the first-price auction is a classic trade off: marginal benefit and marginal cost. The marginal benefit of raising your bid is you increase the probability of winning. The marginal cost is you’ll get less surplus if you win. But in summary, in the second-price auction I bid “truthfully my value,” but if I win I only pay the second price. In the first price auction I bid less than my value but I pay what I bid if I win. That leads us to the natural question. Which of these two auctions, at least in expectation, is going to raise more money? Let’s make some assumptions. Let’s assume that it’s a purely private value environment. And let’s also assume that these values are completely independent, that my value is statistically completely independent of your value: they’re just completely idiosyncratic. Let’s assume that we’re all kind of basically similar except for that. So I’m going to assume independence, symmetry, private values: most simple thing you can imagine. Let’s ask the question again. So I’m selling the good now, would I rather sell this as a second-price auction in which at least you’ll bid your values but the winner will only pay the second value; or would I rather sell it as a first price auction in which you’re all going to shade your values because of this effect of trying to get some surplus, but at least the winner will actually pay you what they bid. Which is going to generate more revenue for me? Let’s have a poll. Who thinks I should sell it–Who thinks I’ll get more revenue from a second price auction? Who thinks I’ll get more revenue from a first price auction? This is the last poll of the class. We can surely get no abstentions here. Let’s try it again, no abstentions: last poll of the class, last poll of the whole course. Who thinks I can expect more revenue from a second price auction in which people will bid their values but I only get the second price? Who thinks I get more revenue from a first price auction in which people pay what they bid, but they all shade their bids? There’s a slight majority of the second price. So here’s a great theorem. Provided we’re in the setting I said–pure private value, absolutely independent, my value is completely statistically independent of your value, and we’re all basically similar–independent, symmetric, private value–both of those type of auctions we mentioned, the first price auction and the second price auction, and indeed, any other kind of auction which has the property that in equilibrium, the person with the highest value ends up winning the good. Any such auction in expectation yields exactly the same revenue, in expectation. The first price auction, the second price auction–or any other silly old auction you come up with, at least it has the property that in equilibrium, the highest value wins–all of them generate the same revenue in expectation. But to find out why, you’re going to have to take another class in Game Theory. We’re done and I will see you at the review session.